As the weather warms up, the grills come out! We’ve got some excellent recipe suggestions for you to pair with our wonderful wines. Who doesn’t love some cold bubbly when it’s hot out? 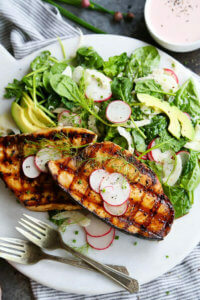 Try our Sparkling Pinot Noir Rosé which goes great with this Grilled Swordfish with Tangy Rosé Mayonnaise. Our Sauvignon Blanc is a summer favorite here at Eola! 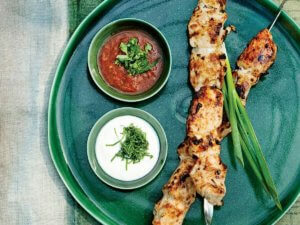 Pair it with Tomato and Cilantro Marinated Chicken Shashlik. Patriotic Red is a crowd pleaser that’s great all year long! 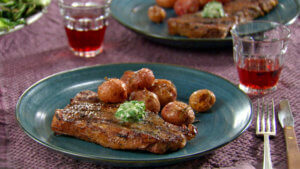 Pair it with Grilled Strip Steak and Garlic Herb Butter for a decadent summer meal. Our classic Rosé is just calling out for some grilled food! 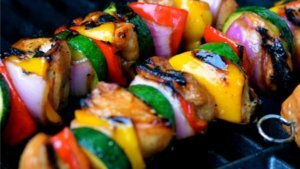 Try it with these Honey Chicken Kabobs.